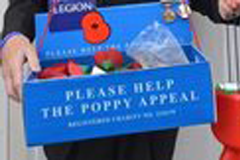 Two brothers have each been jailed for a year after stealing Poppy Day Appeal tins from hotels in the west Midlands. Adam Tookey, 22, and Karl Tookey, 25, were arrested after being caught on CCTV taking a tin from the Holiday Inn in Sandwell on Wednesday. The pair, from Thornfield Road in Birmingham, also took a collection box from the Britannia Hotel in the city. They pleaded guilty to two counts of theft when they appeared at Warley Magistrates' Court. Amy Sanders, 22, from the same address, pleaded not guilty to theft. She was bailed to appear at Wolverhampton Crown Court on 11 February.